Conni Peters, Justa Turner, or Dixie Purselley for your Equine Insurance needs today! 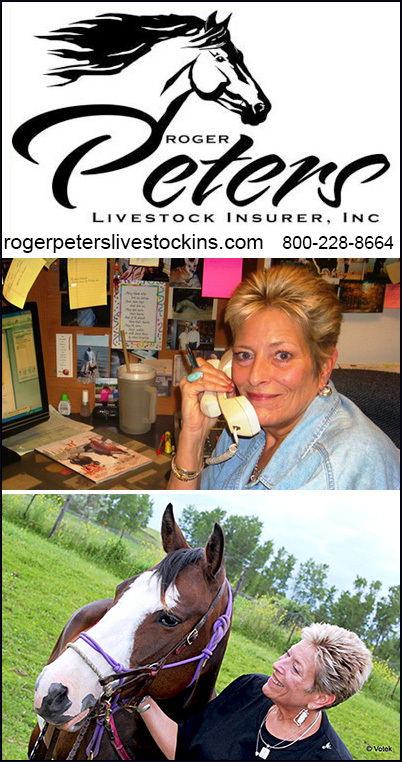 Roger Peters Livestock Insurer, Inc has been a part of the Horse Insurance Industry since the mid-70's. A combination of his passion for Cutting horses and his successful career as a Life Insurance Agent eventually lead him to sell a bit of horse insurance as a side line. It did not take long for the business to grow. Bringing his youngest daughter, Conni, into the business allowed Roger to hit the road in per suit of his dream. To be inducted into the National Cutting Horse Hall of Fame which he did in fact achieve. Conni has run her father's business with love and pride for 27 years. Roger is enjoying his retirement with his wife Lisa and their beloved Boxer, Stoney. How Is Roger Peters Insurance Different From Other Agencies? You can't put a price on experience and that is what Roger Peters Livestock Insurer, Inc. offers. Experience along with honesty, a friendly small staff of Agents allows you to get to know your agent when you insure your animals with our office. When you call our office you will talk to an agent. You will deal with either Conni, Stacy, Dixie or Justa and your needs will be met the same day. It's all about knowing and trusting your agent and service. We offer both. What Are 6 Common Mistakes That Insurers Need to Avoid? Selecting Policies Based on Premiums Alone: Since premiums are pretty standard in most categories, price shopping is rarely worth the time. Read your policy carefully and pay very close attention to the COVERAGE-- more so than the cost- because all insurance policies are not the same! Neglecting to Read and Thoroughly Understand The Policy: A poor understanding of your policy can mean you get too much-- or not enough. Find out now-- before you have a claim! Leaving Gaps In Disclosure: Even minor health problems in a horse's history MUST be reported on the application for insurance! Failing to Report Accidents IMMEDIATELY: The importance of reporting accident, injury or illness of an insured animal can not be expressed strongly enough. Late reporting can jeopardize your claim. If the horse is sick or injured enough to call the Vet-- then you MUST call your insurance company! NOTE: You Must REPORT the sickness or injury to the company prior to expiration date of your coverage. In doing so, you will trigger a 12 month extension of the Mortality coverage should the horse die within that time from that reported cause. When you call Roger Peters Livestock Insurance, Inc., ask your agent about the following optional coverage's available for an additional premium. We offer FREE Emergency Colic Surgery up to 3,000.00 not to exceed the insured value of the horse. Not available with all companies. Talk with your agent. Major Medical insurance reimburses the veterinarian's fees for surgery, major illness and disease. We will pay reasonable and customary charges necessitated by accident, injury or illness for your insured horse. There is a $250 deductible for each claim and up to $7,500 limit per animal per year, depending on the company. This coverage will help you control veterinary expenses for unforeseen events related to the health of your animal. Available for horses age 30 days through 14 years. Surgical Only. "Surgical Only" coverage available with a minimal deductible. Coverage is for the actual cost of the surgery and will pay up to 50% of that amount for non-surgical charges. Loss of Use is a situation wherein your horse becomes totally and permanently incapable of fulfilling the functions for which it is used, as stated on your policy, but its condition does not necessitate destruction for humane reasons, you may suffer a financial loss. The Loss of Use extension will pay you a percentage of the animals insured value. Full X-ray reports and soundness exams are required for approval at the inception of this endorsement. Ask your agent for a full explanation of this coverage. Personal Liability is in the event your horse injures a third party or damages their property, this policy provides coverage for defense fees and pays claims for which you are legally liable during the policy period. Ask your agent for a full explanation of this coverage. This policy is available on PROVEN Breeding Stallions only. This coverage provides you payment of the insured value of your Stallion, if during the policy term he becomes PERMANENTLY impotent, infertile or incapable of servicing mares due to an accident, sickness or a disease. Call Conni, Stacy, Dixie or Justa Today! Being prepared for the unforeseen is the sole purpose of insurance. Conni, Dixie, Justa and Stacy are avid horse lovers and understand the particular needs and concerns that horse owners face today. You will love their personalized service, friendly "I can help" attitude and, the quality of the insurance they offer. Just call today—and rest easy for your tomorrows!